Sleep electroencephalogram (EEG) measures, such as spindle and slow wave activity (SWA), are associated with cognitive and behavioral outcomes. For instance, sleep spindles are related to synaptic plasticity underlying learning and memory, and slow wave activity during sleep is thought to be restorative. Deficits in spindle activity and slow wave activity are associated with neuropsychiatric disorders like schizophrenia and depression. Sleep EEG recordings in adults are heritable (i.e. genetically inherited), and differ from those in adolescents. This is because the brain is still developing during adolescence and undergoes structural changes that influence oscillatory activity. The role of genes in sleep EEG in adolescents is currently unknown. This week in the Journal of Neuroscience, Rusterholz and colleagues used high-density EEG to examine sleep-specific oscillations and their heritability across various brain regions in adolescent twins. Eighteen pairs of monozygotic (MZ) and 12 pairs of dizygotic (DZ) adolescent twins between the ages of 11 and 14 years took part in this study. Their sleep was monitored for at least five nights to ensure that they were getting adequate sleep each night, after which high-density sleep EEG was recorded for two consecutive nights. The first night served as adaptation to the sleep EEG equipment. EEG recorded on the second (baseline) night was used in subsequent analyses, except when data quality was poor, in which case EEG data from the adaptation night was used instead. The measures of interest included sleep EEG power (strength of the oscillations) in various frequency bands, ranging from slow oscillations between 0.6 – 1.2 Hz to gamma oscillations (at a higher frequency) in the 24 – 44 Hz frequency band. The authors also examined spindle characteristics like amplitude, duration, density, and integrated spindle activity, which is the integrated spindle amplitude over time (i.e. 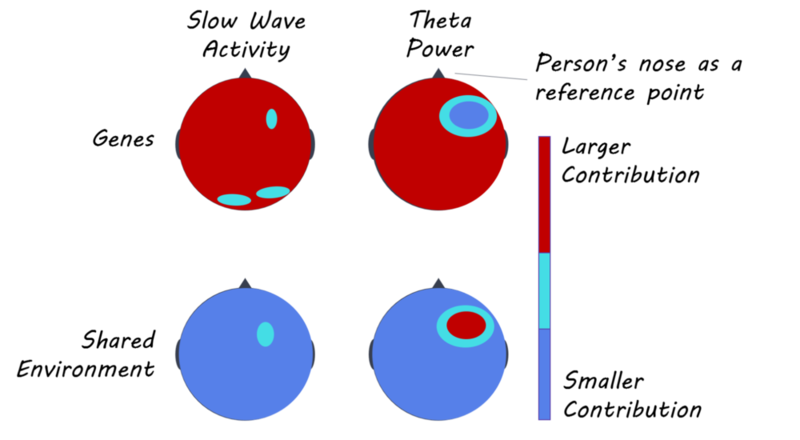 intensity of spindles). Structural equation modeling (SEM) was used to estimate the contribution of genetics and environmental factors to the sleep EEG measures, while differentiating between shared and unique environmental factors that the twins were exposed to during development. Genes strongly contributed to slow wave activity in many cortical regions, accounting for 60 – 93% of variance in slow wave activity, whereas unique environmental factors explained 30 – 44% of variance in slow wave activity in frontal regions. Shared environmental factors did not significantly contribute to slow wave activity. Sleep spindles in posterior regions of the brain were influenced strongly by genetic factors, whereas shared environmental factors contributed to spindles in more anterior regions. Shared environmental factors contributed to spindle amplitude and integrated spindle activity in anterior brain regions for slow (10 – 12 Hz) and fast (12 – 16 Hz) spindles. Moreover, both shared and unique environmental factors contributed to the density and duration of sleep spindles. Specifically, shared environmental factors contributed to the density and duration of fast spindles in fronto-central brain regions, and unique environmental factors influenced the density and duration of fast spindles in posterior brain regions. Slow oscillations in frontal and temporal regions were influenced by unique environmental factors, whereas genes strongly contributed to slow oscillations over widespread cortical regions. For EEG power in alpha, beta, theta, and gamma frequency bands, genetic contribution ranged from 70 – 96%, indicating that sleep EEG power in these frequency bands is primarily determined by genetic factors. Genes and shared environmental factors contributed equally to theta power in lateral fronto-parietal brain regions. This is the first study to show the contribution of genetic and environmental factors to sleep oscillations in adolescent twins. In particular, EEG power (strength of neural oscillations) is highly heritable and determined by genetics, whereas genetic and environmental factors differentially contribute to slow oscillations, slow-wave activity, and spindle activity across brain regions. The onset of many neuropsychiatric disorders occurs during adolescence, therefore, the characteristics and heritability of adolescent sleep EEG could provide neurophysiological biomarkers for these disorders. Rusterholz et al. Nature and Nurture: Brain region specific inheritance of sleep neurophysiology in adolescence. The Journal of Neuroscience (2018). Access the original scientific publication here.